Which is why having your partner do some of the cooking is a lovely way for him to nurture not only you, but also his growing baby. But knowing what he can cook for you when on a restricted pregnancy diet, and also what vitamins and minerals you need more of and when, is tricky. 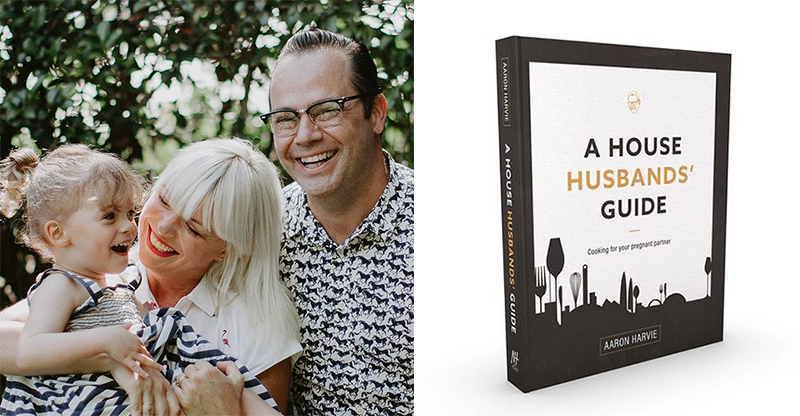 This is where Masterchef alumni, Aaron Harvie’s cookbook for dads A House Husbands’ Guide – Cooking for your pregnant partner, is brilliant. Shevonne Hunt from Feed Play Love sat down with Aaron to talk about his ‘love in action’ cookbook. First up, Aaron explains something that is very common among men: How they can sometimes feel helpless, or even disconnected, from their growing child because they’re not the ones experiencing pregnancy firsthand. So what can guys do to feel more involved in the development of their child? A really great and practical way to combat this feeling of disconnection – and to also show how much they appreciate what their partner’s body is doing – is for dads-to-be to give the gift of good food to their partners, says Aaron. The foodie dad did this himself when he lovingly cooked for his partner when she was pregnant, and boy did it pay off! “I was an active part in my partner’s pregnancy. I was an active part in my child’s development and I was winning a lot of brownie points,” he laughs. From this, Aaron’s idea for a cookbook for dads-to-be to show their support and involvement in their partner’s pregnancy was born. With pregnant women often feeling disheartened after being told they can’t eat this or that for nine long months, Aaron made it his mission to make the recipes in his cookbook, while still being pregnancy-friendly, enticing and exciting. “You’ve got to put interesting stuff in it. I looked it as a challenge and and it was one that I quite enjoyed,” he says. Dumplings and lots of Asian cuisine! Aaron’s recipes are far from boring with dumplings and lots of other Asian dishes, that are packed with healthy veggies, on the menu. “Asian cuisine contains a lot of vegetables. If you look at how westerner’s eat, it seems a lot of the time the vegetables are an afterthought,” he says. As well as being nutritious, Aaron assures us that his pregnancy recipes are also easy to make. Even the not-so-gifted-in-the-kitchen could give them a go. “They’re all easy to cook and really tasty and if you follow the recipes along, there’s a lot of cool technique in there as well that you can apply to other dishes,” he says. Of course the sweetest thing about this cookbook is that it comes from such a good place: A dad wanting to support his partner through pregnancy by giving her the gift of good food. What a guy! Who wouldn’t appreciate their man for doing this? So guys, get cooking. Your preggy partner and baby on the way will love you for it.